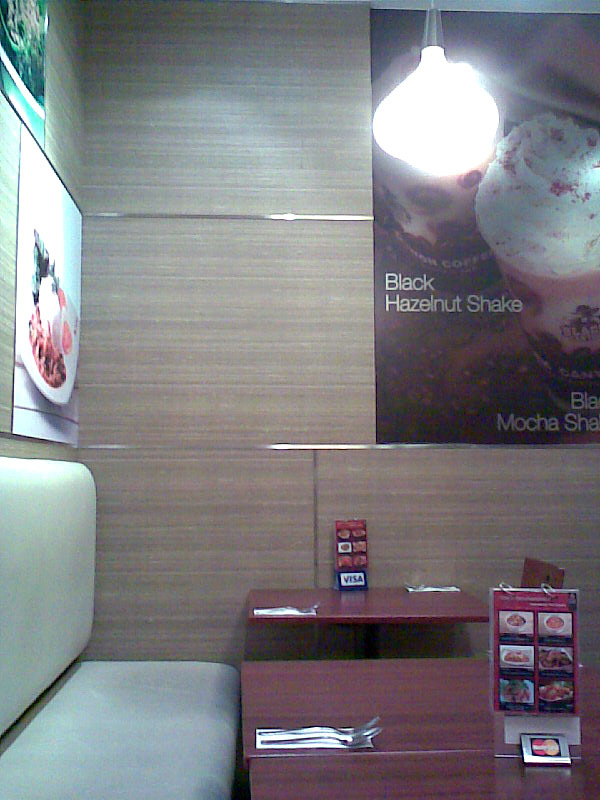 Black Canyon (Thailand) Co. Ltd. was established in 1993 and is the owner of the "Black Canyon" coffee house concept. There are currently more than 180 Black Canyon branches throughout Thailand. Singapore was the first country outside of Thailand where Black Canyon opened, back in 2002. In 2006, operations moved to a new location on East Coast Road - a popular dining destination for Singaporeans. Saw this place a couple of times I been in the Katong area but never got around to trying it out. So after hearing from my friend that this place serves nice coffee and is a popular outlet when she went to Thailand, I decided to give it a shot. WHen I went there at around late afternoon, not many customers were there. But the staff were not really that prompt in serving us. Nevertheless, they were friendly and gave some suggestions on what coffee were nice. So I ordered a Mexican iced coffee, which had Kahlua syrup in it. It had a nice taste and was served in a cute looking shoe-shaped glass. On the menu, saw that there were acouple more speciality coffee, which I may give a try in future. Black Canyon has been on East Coast Road for the last 5 years and I finally step foot into this place one quiet evening, not knowing what to expect. It was late on a weekday so there were only 2 other tables occupied. In fact when we walked in, they were going to take last orders in 15 minutes. But the staff were still smiling and welcomed us warmly which is rare when one arrives so near closing time. The place is modern looking, great for friends to hang out, families to gather and casual business meetings. It's quite spacious too with plenty of seats in 3 sections; outside, dining area with proper tables and chilling area with more cushion like seats. Taking our time ordering (the staff didn't rush us and didn't hover around us) we came up with the following. Food Ordered: Spicy Glass Noodles Salad $7.95 Our little starter which was delicious. Two of us shared this dish but we were a little full by the time we were done with it. It was certainly spicy but not overly done. The crunchy nuts were a nice addition to the dish. 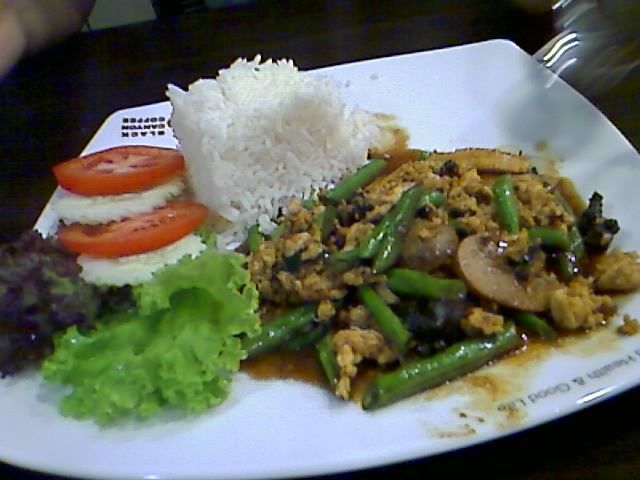 What I liked most was that it wasn't oily despite having all that spice. 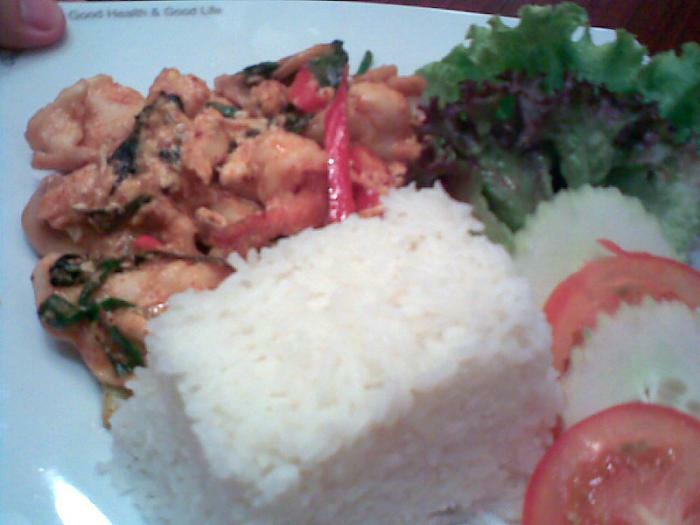 Spicy Stir Fried Seafood and Basil with Rice $8.95 This was my friend's order. It was really spicy though he didn't have any other complaints about it. I liked how the rice came in cubes. 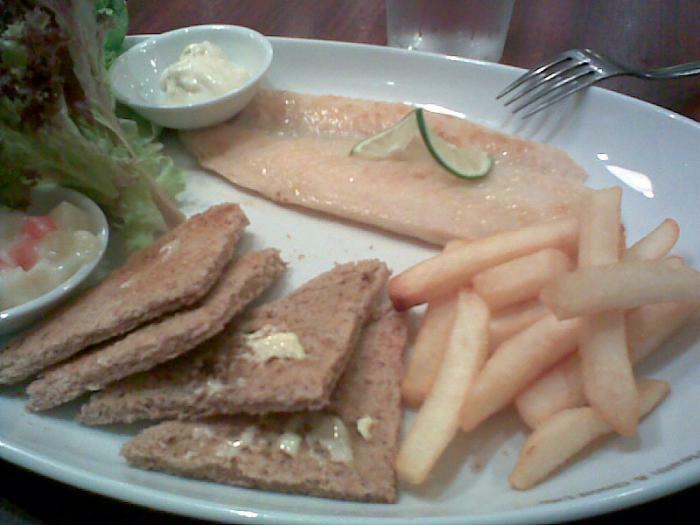 Fish Fillet Steak $9.95 My dory was served with chips and some toast. The toast was a little dry but it was the wholemeal (wheat) sort which I pretty much liked so that was fine. The outside of the dory was a little dry but still quite tasty. We spent about $30 for the two of us which included a drink. I think it's pretty reasonable since we were famished when we got in and really full when we staggered out. Worth a try! haha. camera phone resolution really bad. lol. Spotted this outlet at East Coast after seeing the long long long queue at Astons. Just wonder why so long...seems almost eternity to queue for Steaks at Astons. So we gave up on Astons and drove further down towards Katong Shopping Centre. We spotted Black Canyon and decided to give it a try. Looking at their menu, they have quite a wide selection of Specialty coffee from Mexico, Austria, Italy, Thailand and the standard coffee. I tried the Black Canyon Coffee Frost and the effect of the coffee lasted the whole night - could not sleep until do not know when. So if you need to burn the midnight oil and have a paper to study for, this is the coffee to take! 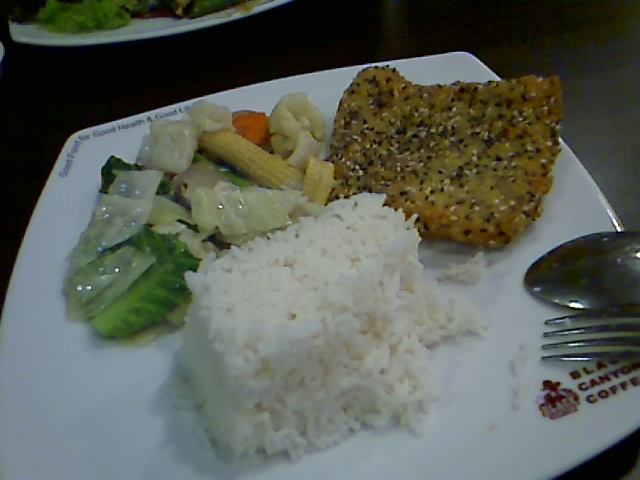 Since we were there for a meal, we opted for the Sesame Crusted Fish Rice and the Special Chicken Basil Rice. Servings were just right and food on the whole was average. Would surely visit this place again to try out the different types of coffee and perhaps drop by after dinner. Nice cosy atmosphere and seating is also plentiful. The only problem is parking....parking along East Coast Road is a perpetual problem. Sorry about the pictures...use camera phone lah. The rice is served like a block. That's cute. Like going to ECP in the past cos its free parking. But ya, it gets crowded at night. teehee such a coincidence.. I used my camera phone also!